USCIS began accepting H-1B petitions on April 1, 2010. If approved, beneficiaries of these petitions may start working in H-1B status on or after October 1, 2010 – the first day of FY 2011 cap season. The following table includes every cap count released by USCIS. The table will be updated on a regular basis to show the pattern of this year’s H1B filing. Update 1: On December 24, 2010, the Master’s Exemption Cap of 20,000 has been reached. USCIS continues to accept these petitions which will be counted against the regular cap instead. Update 2. 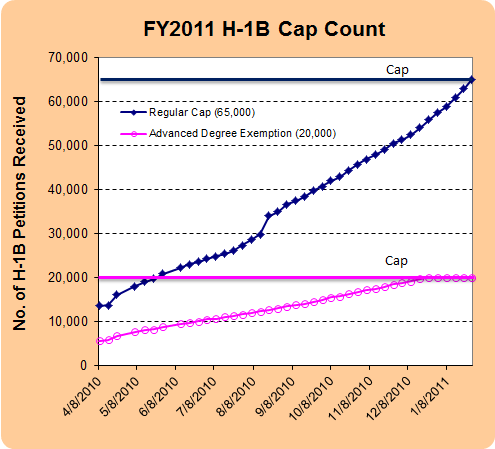 On January 27, 2011, USCIS announced the regular FY2011 H-1B cap was also reached. This entry was posted in Visa and tagged cap count, H-1B, Visa. Bookmark the permalink.